Beautiful handmade recycled silk sari bunting, which makes each triangle flag different to the next creating unique strings of bunting every time. Each set of bunting has 12 flags, spread across a length of 200cm and either end has a little loop for easy hanging. 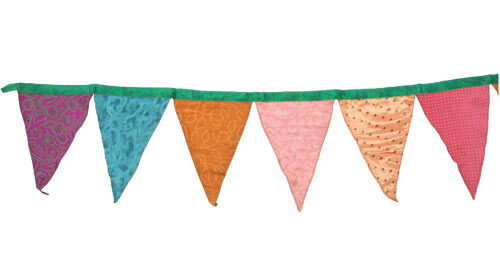 We love this bunting dearly, and think it makes an excellent addition to any home. Made in India, any sales of the bunting go towards helping the producer provide stable employment for its artisans in some of the poorest areas of India.